Hi, I’m Jenn, a 27-year old Assistant Manager working in a local IT firm based in Kuala Lumpur. As I write, I’m earning RM 5,000 a month and have saved myself around RM 50,000 after 5 years of working. I intend to buy myself a new car this year. I’m considering a Japanese model car which is priced around RM 100,000. I’d talked to Angie, a close friend about my ‘car’ plans. She suggested that I should opt for a car loan where its tenure is not more than 5 years. She believes that I would save interest payments on my loan and it is financially wise for me to get out of debt as soon as possible. – How to Calculate the amount of Monthly Installments of a Car Loan? – How to Calculate the Effective Interest Rates of a Car Loan? How Monthly Installments of a Car Loan is Calculated? From above, the Japanese model car costs RM 100,000. Let us assume, Jenn is applying for a car loan where its nominal interest rate is 3.00% per annum and is placing RM 10,000 or 10% down payment to purchase her car. Here, I would show you 2 sets of calculations based on her car loan amount of RM 90,000. The first is for a 5-year car loan and the second is for a 9-year car loan. From above, Jenn may opt for a 5-Year Car Loan if she intends to ‘save’ on total interest costs in absolute figures of her car loan. However, if she intends to free up her monthly cash flow, then, Jenn may opt for a 9-Year Car Loan. How to Calculate the Effective Interest Rates of a Car Loan? 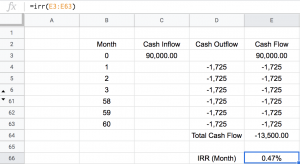 Once again, this involves the usage of the Internal Rate of Return (IRR) formula. I had wrote one of its many applications in an article on Cash Advance. It comes with a 3-step process to calculate the effective interest rate of an investment or a loan (cash advance) offered by local banks. Here, I will also be using the same 3-step process to calculate effective the effective interest rates of a car loan. By using the IRR calculator, you’ll find the IRR is 0.47% per month for taking up the 5-year car loan. 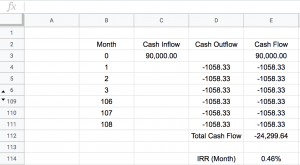 Step 3: Translate it to IRR on a Yearly Basis. This is simple. Just multiply the IRR of 0.47% a month with 12 months. Thus, its IRR on a per annum basis is 5.64%. This is the true cost if you decide to obtain a car loan from the bank, which is not exactly ‘3.00%’ stated by the bank. By using the IRR calculator, you’ll find the IRR is 0.46% per month for taking up the 5-year car loan. This is simple. Just multiply the IRR of 0.46% a month with 12 months. Thus, its IRR on a per annum basis is 5.50%. This is the true cost if you decide to obtain a 9-year car loan from the bank, which is almost similar with 5.64% calculated for a 5-year car loan. Do you plan to buy yourself a property in the near future? Let’s assume, banks are comfortable to limit their lendings to a borrower of up to 60% of their monthly income. Thus, the maximum debt-servicing ratio (DSR) is 60%. In Jenn’s case, banks would limit their lending to an amount where her maximum monthly installment is RM 3,000 (60% of RM 5,000). The installment includes debt repayments on mortgages, car loans, outstanding credit card debts, personal loans, PTPTN … etc. As such, in Jenn’s case, if she opts for a 5-year car loan, her monthly installment is RM 1,725.00. She would be left with a loan installment quota of RM 1,275.00 per month. Based on the Rule of 200, Jenn’s maximum loan eligibility works out to be RM 255,000 for a mortgage. Instead, if Jenn opts for 9 years, her monthly installment is RM 1,058.33. Jenn is then left with a loan installment quota of RM 1,941.67 per month. According to the Rule of 200, Jenn’s maximum loan eligibility is RM 388,334 for a mortgage. Hence, if Jenn opts for a 9-year car loan, she would be able to borrow RM 130+ thousand in mortgage to buy a property. That, I believe, is a huge drawback for Jenn who instead opted for a 5-year car loan. Conclusion: Should I Opt for 5 Years or 9 Years? Lower Installment Amount, thus, Free Up Monthly Cash Flows. Save Up for Investments like Stocks and Properties or to Buy Insurance Products for Protection Purposes. Preserve Loan Eligibility Amount to Buy Investment Properties. If your answer is ‘no’, I believe, most likely, you’ll get yourself a newer car, thus, applying for a brand new car loan in the future. In this case, you’ll not remain a person who is debt free once your car ages and depreciates in value over time. So, what’s your verdict? 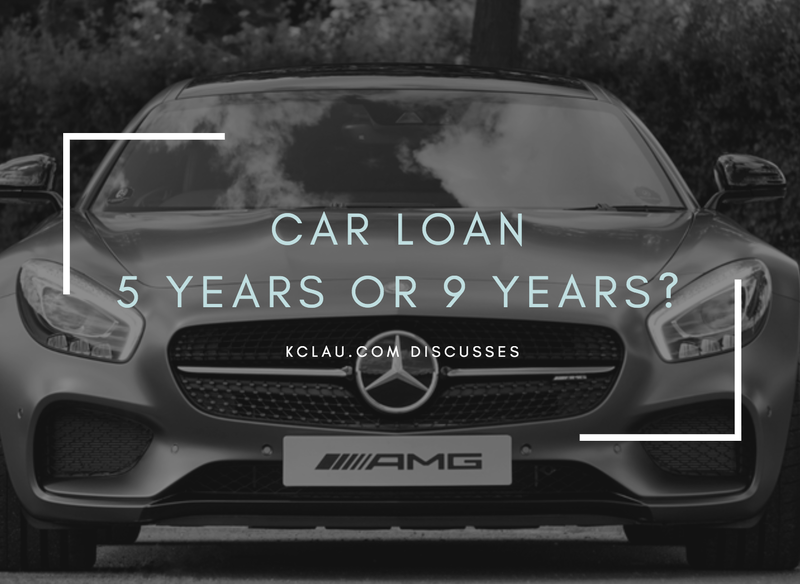 Is it a 5-Year Car Loan or a 9-Year Car Loan? « Previous Post Should I take Cash Advance for Investments? Next Post » Is P2P Financing a Suitable Alternative Investment Vehicle for You? 3 replies to "Should I Take a 5-Year Car Loan or a 9-Year Car Loan?" I will borrow the least from bank and settle loan in a short tenure if possible. Think about the maintenance cost and wear & tear expenses of your car after 5 years if you are still repaying the loan then. It will be less burden if your loan has been settled. Or just opt for a cheaper car for more flexibility. Hi, thanks for your very enlightening article on car loan. May I know what Effective Interest Rate essentially means? What’s its difference with the normal interest rate?